This page is obsolete. Please click over here instead. features a Spitz A3 star projector. It is used for astronomy classes and for groups from schools and other groups. If you have a group of ten or more, you can arrange a free, one-hour sky tour during business hours. Please email Dr. Michael Allen at to arrange. We regret that we cannot offer general public access at this time. We are presently raising funds for a new digital projector and the capability of offering public events. The WSU Foundation will be happy to assist you if you wish to accelerate the upgrade with a financial gift (donate to "astronomy development fund"). 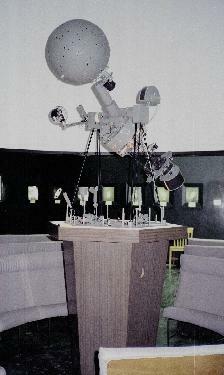 Renovation of the planetarium projector is the top priority for facilities improvements in the department. October 1 Spitz Skydome demo! 7:30 p.m. Demo for the community. Public invited!